Photo details: Canon 100mm macro lens on Canon EOS 50D, ISO 100, 1/250 sec, f/14, MT-24EX flash 1/4 power w/ diffuser caps. During my visit to Salt Plains National Wildlife Refuge in northwestern Oklahoma this past June, tiger beetles were not the only wildlife subjects I encountered. Near the edge of one of the alkaline flats along Sandpiper Trail was this hognose snake. This is the second hognose snake that I’ve encountered in as many years, the first being a member of a rare, disjunct population of the dusty hognose snake (Heterodon nasicus gloydi) in one of southeastern Missouri’s critically imperiled sand prairie habitats. There are two species of hognose snake in Oklahoma – eastern (H. platirhinos) and western (H. nasicus). I presume this individual to be the western due to its strongly upturned rostral (snout), which is only moderately upturned in the eastern species, and black-checkered ventral coloration. Surprisingly, in checking the Salt Plains reptile species list for confirmation on its identity, I noted that no confirmed sightings of either the eastern or western hognose snake have been recorded at the refuge. I have since done my good deed to reptile science by submitting this and another photograph I took of the individual to the refuge biologist. Ted MacRae – entomologist and discoverer of new reptile records! 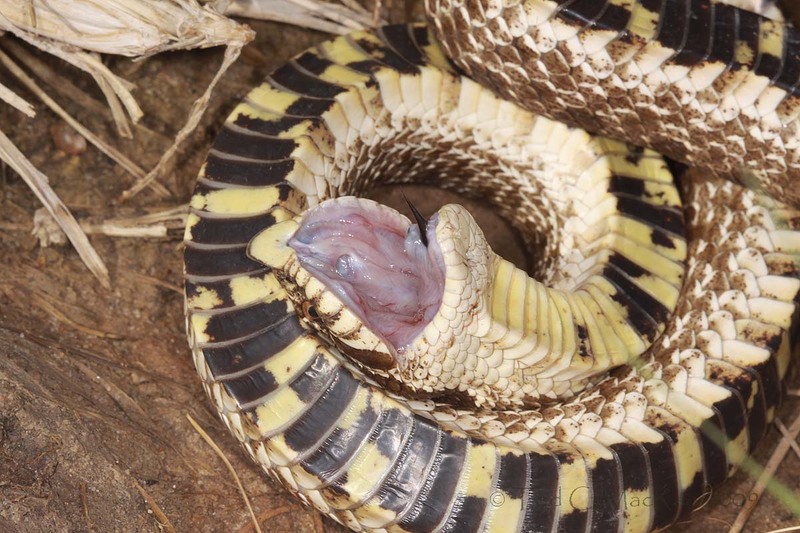 Western hognose snakes are further classified into three subspecies, two of which – dusty and nominotypical – occur in Oklahoma (the third occurs in Mexico). However, the distinctions between the two U.S. subspecies are subtle¹ and not apparent in this photograph, preventing further classification. ¹ Some authors consider the dusty and western hognose snakes to be separate species, while others have regarded their differences too subtle to warrant even subspecific distinction. Hognose snakes are famous for their well-choreographed sequence of defensive displays. Their first act is to rear up cobra-like and strike out with their mouth open while hissing (unfortunately, neither of the hognoses I’ve encountered entertained me in this manner). If the threat continues, they then turn over and writh violently in mock agony before finally rolling over on their backs and playing dead (thanatosis). Last year’s hognose snake didn’t do this either, insisting instead on continually trying to burrow into the loose sand. As can be seen from the photograph above, however, playing dead is exactly what this individual did. With the mouth agape and the tongue protruding, it’s a convincing display of lifelessness. Amusingly though, whenever the snake was righted it immediately turned over on its back again – not such a good imitation of being dead! Presumably the snakes predators are as bad at noticing that detail as are the snakes themselves. As I continued to pester this individual, trying to get him to stick out his tongue further for a better photograph, he eventually started ejecting blood from the lacrymal glands and emitting musk from the cloaca – what better to emphasize a death display than blood and an offensive smell! Western hognose snakes are classified as a species of ”least concern” on the IUCN Red List of Threatened Species and aren’t listed as a species of concern on the Oklahoma Natural Heritage Inventory database. Nevertheless, as with many other reptiles and amphibians, populations are declining throughout much of their former range. This is likely due to the combined effects of urbanization, reduction of habitat, predation by feral dogs and cats, and overcollection for sale to the pet trade. This entry was posted in Reptilia and tagged behavior, Great Plains, herpetology, nature, Oklahoma, predator avoidance, reptiles, salt flats, snakes, taxonomy. Bookmark the permalink. Awesome. I have found that our eastern hognose snakes here in Ohio are one of the most fascinating herps that we have. I’ve only seen their display once, but it amazed me how limp and limber the snake became, and it stayed that way for several minutes. It wouldn’t stop playing dead until we left for a few minutes, we came back, and it was gone. Thanks, Tom. I don’t think I’ve spent near the time with any other snakes that I’ve seen as I have the two hognoses that I’ve seen. They are fun! When I was a kid in New Jersey, I had several eastern hognoses for a brief time. Never played dead, but did their cobra display once. They were really fun. Brought up a lot of memories. Thanks! Thanks, Kirk – I’d love to see the cobra dispaly once. Great photo and I enjoyed the writeup. It doesn’t matter how many times you see the cobra display, it always gets the heart racing. When I was a child, the first one that I remember gave me a real start. I rushed home and told my dad that there was a cobra in our field. He laughed and explained about hognose snakes to me. I’m not sure, I still think it may have been a cobra loose in the wilds of Texas. Thanks, Troy. I feel cheated I didn’t get the cobra display – this guy just flopped over as soon as I started messing with him. I really wanted to get a photo with the tongue haning way out, but every time I got setup for the shot he pulled it back in. Oh well, at least I got the ‘play dead’ routine this time – and boy did he stink! The snake looks dangerous and deadly. I for one wouldn’t go near it. We can’t lose you to the dark side! Yet another example of my failure to focus! This snake is weird to say the least! When we first moved to our place in the Arkansas Ozarks, hognose snakes were fairly common. I’ve seen the full display of cobra-like behavior followed by playing dead several times. I haven’t seen a hognose in several years, though. While the observations of one person don’t amount to a population survey, I can’t help but feel the species is in decline here. Where we live isn’t natural. It’s a mixture of woods and pastures, but that’s the way it’s been for a long time. I don’t know what would account for the decline if it has, indeed, occurred. I don’t think there’s any question that reptiles and amphibians in general are really taking it on the nose right now. Sadly, it’s hard to be real optimistic about their future as well. Cool – a pet snake that doesn’t just lay there! Snakes definitely have personalities. I think this one was intimidated by your vocabulary and decided to go straight for playing dead. You’re welcome. Two hognose experiences and no cobra display yet – I’m gonna have to try harder. Hi Ted, somehow I missed this post but am glad to be visiting from HoH. Sounds like you have a pretty fun time in the field! I picked up a garter snake once and I can promise you that they could stink up the place just as well as the hognose! Hi Amber – no worries, I can hardly keep up with all the great nature blogging by others, myself. Yes, I have a blast in the field – the worst day in the field is better than the best day of just about anything else. I feel a great pity for your Hognose. Being limbless, he lacked the ability to throw one arm over his brow to enhance his dramatic gestures. Clearly, he should be on stage. We have the Southern Hognose snake but I haven’t seen one for a while. They certainly put in an intimidating show. Thanks, Joan. They certainly seem to be hit or miss.